Top: Stone Dam Park is built around one of five new, year-round lakes that use naturally treated urban runoff. Above: Lush with date palms and cultivated farmland, Wadi Hanifah is where the Saudi capital developed. own by the lake, Hussein Al-Doseri is beaming. "Before all this, there were no services here—no trails, no routes. Now it's easy." "I come here all the time, day and night," grins Al-Doseri. "It makes me happy, to relax and spend time with my family by the water. It feels like the opposite of Riyadh. Nowadays, if I want to meet friends, I tell them: 'To the lake!'" In 1917, St. John Philby made this photograph of Dir'iyyah from across Wadi Hanifah. Wadi Hanifah's role as a highway of ideas and conflicts was of central importance during the events leading up to the creation of Saudi Arabia. A 1744 agreement between Muhammad ibn Sa'ud, the ruler of Dir'iyyah, a town on Wadi Hanifah, and religious scholar Muhammad ibn Abdul Wahhab, from Al Uyayna ("The Little Spring"), in the wadi's upper reaches, established what later became known as the First Saudi State. The Saudi–Wahhabi alliance remains in effect today. From their base at Dir'iyyah, Saudi forces conquered large parts of Arabia before military defeat in 1818. Dir'iyyah was abandoned, and settlement shifted a short way downstream to Riyadh. When 'Abd al-'Aziz ibn Sa'ud recaptured Riyadh in 1902, it was the first in a chain of victories that led to the establishment of the modern Saudi kingdom in 1932, with Riyadh as its capital. Today, Dir'iyyah, where 19th-century mud-walled ruins overlook the wadi, has been subsumed into the larger city, as have such other old Wadi Hanifah towns as Manfuha. Rising in the highlands of al-Hissiyah, on the Najd plateau of central Saudi Arabia, Wadi Hanifah runs southeast for around 120 kilometers (75 mi) before losing itself on the fringes of the Rub' al-Khali, or Empty Quarter. 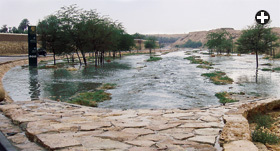 Fed by more than 40 tributaries, this great watercourse has a catchment area covering much of the eastern Najd, more than 4500 square kilometers (1740 sq mi), across what was historically known as al-Yamamah. The meandering valley (wadi in Arabic) is dry for nearly all of the year, but remains fertile thanks to aquifers close to the surface. It has attracted human settlement for millennia. Centuries before Islam, the tribe known as Banu Hanifah (hanifah means"pure" or "upright" in Arabic) was farming and trading up and down the valley. Among the towns and cities they founded was Hajr ("stone"), which became al-Yamamah's capital. Described firsthand by the 14th-century traveler Ibn Battuta as "a beautiful, fertile city, with abundant water," it eventually gained the bucolic name by which it is known today: al-Riyadh ("The Gardens"). As a village, and then as a small town, Riyadh grew with its population. But from the early 1970's, as Abdullatif Al Asheikh, president of the Arriyadh Development Authority (ada), has stated, "significant expansion in the city's area [and commercial activity] affected the wadi badly." Rapid growth overwhelmed fragile ecosystems. Quarrying for stone and extraction of soil for construction work undercut the banks of the flood channel. There was unregulated mineral mining. Date palm plantations flanking the wadi encroached on the flow channel, which was further impeded by uncontrolled dumping. As a result, the seasonal flash floods caused unnecessary erosion and swept pollutants into residential neighborhoods. Stagnant water jeopardized public health. By the 1980's, soaring water demand was overwhelming Riyadh's traditional dependence on self-replenishing aquifers. As the water table dropped below sustainable limits, the city turned to desalinated water, piped 400 kilometers (250 mi) from the Arabian Gulf coast. This caused its own problems, including increased surface runoff and rising groundwater contaminated with sewage—most of which was channeled into Wadi Hanifah. Construction, between 1975 and 1984, of the city's first wastewater treatment plant at Manfuha, beside the wadi in southern Riyadh, led to upward of 400,000 cubic meters (14 million cu ft) of effluent being discharged into the wadi every day. Downstream, this smelly, unsanitary water pooled into fetid lakes. [+] Click here to download image above in high resolution (12.3Mb). This bilingual map shows the middle 50 kilometers (35 mi) of Wadi Hanifah, along with major features of the 10-year project. Aerial views of the upper wadi, which is dry except during winter rains, and the three-pond, 134-cell bioremediation facility, which produces water safe for human contact at one-third the cost of a mechanical treatment plant. As local farmer Ibrahim al-Salim told the ada: "There came a point when it was impossible for us to stay any longer. We left the valley." But the problems were not going unheeded. Saleh Al-Fayzi, long-standing director of the ada's Wadi Hanifah Restoration Project, spoke to me with quiet passion about his involvement. "I started working on Wadi Hanifah about 20 years ago," he said, when "it had a very bad reputation. It was the city's backyard dump." In 2001 Al-Fayzi headed a wide-ranging ada program of restoration and redevelopment. Working with the Canadian firm Moriyama & Teshima Planners and uk-based engineers Buro Happold, the ada has cleared garbage from the wadi, graded and landscaped it, introduced flood control, replanted native flora and devised a world-leading, natural, sustainable technique to treat the capital's wastewater. Flow channel engineering keeps winter rains from swelling into destructive flash floods. Riyadh receives an average of 100 millimeters (4") of rain each year. That's not much, but it tends to come in the form of sudden downpours. Only 10 days per year on average have rain, and nearly all come between January and April. Across the Najd desert that surrounds Riyadh, these rains flow naturally into wadis. Since the Najd tilts from the high ground northwest of Riyadh south and east toward the Gulf coast, all of Najd's small wadis feed their runoff water into one major artery: Wadi Hanifah. This means that by the time waters reach the edge of Riyadh, they have often swelled into a potentially destructive flash flood. A key feature of the restoration project was to define the wadi's flood flow channel and clear it of garbage and construction rubble, and then to engineer grading and channeling to control its flow and minimize the destructive effects of floods. Walking in Wadi Hanifah today, one finds few signs of its ignominious recent past. At al-Elb, 35 kilometers (22 mi) north of downtown Riyadh, desert bluffs overlook a small dam, and the western bank of the wadi here hosts a line of carefully designed family "picnic pods," backed by tall bankside palms. Each pod is a horseshoe of pale, roughly finished upright limestone slabs, offering both open views out across the wadi—which here holds water only in winter—and privacy from passers-by. More slabs, laid horizontally, create steps and graded slopes down to the wadi bed, where children scamper along trails and families relax in the shade of acacias. There is street lighting along the pedestrian promenade beneath the palms, ample parking and public restrooms. With a breath of wind at my back and birdsong overhead, I talked to Saud Al-Ajmi, a civil engineer at the ada. "We have no open space in Riyadh," Al-Ajmi explained as we sat gazing out over the broad wadi bed to the bare tablelands atop the ridge. "No gardens, no beach. Wadi Hanifah has become a place to breathe." I took a drive with Christopher Walter, a landscape architect at Moriyama & Teshima who works with ada . He explained how the road through Wadi Hanifah was formerly a narrow, often dangerous, crosstown shortcut. Now reengineered, with speed bumps and a 40 kph (25 mph) speed limit, it deliberately nudges through-traffic away. We stopped near the point where Riyadh's Northern Ring Road—a crowded, multilane highway—passes over Wadi Hanifah. Down below, birds chirped in what felt like a desert garden. The wadi was perhaps 100 meters (330') across, and rounded limestone cliffs on either side peeked above high-walled date farms. The urban clamor could have been half a day, rather than half an hour, away. "It's an oasis," Walter smiled. 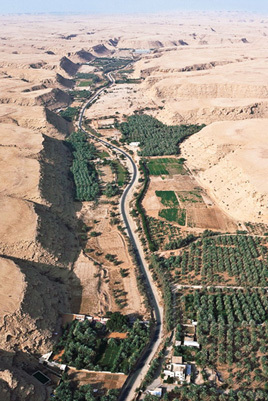 As Al-Fayzi explained to me, the wadi is a "green corridor" between the eastern and western parts of the metropolis and, as such, is easily reached from all points. It is open, without gates. Bilingual Arabic-English signs are both prominent and consistent. Other information boards show a satellite image of the wadi divided into nine named zones, each with interpretive text and a "you are here" marker, alongside icons for mosques, restrooms, walking trails and other features. Every sign bears the project's logo, a stylized acacia branch. "Shrubbery is absorbent," he said. "We deliberately overplanted, to let the wadi find its own natural balance. All these bushes will thin out in time. Overplanting also promotes seed propagation. It helps to populate the wadi with indigenous species." "Date palms can drink 200 liters [52 gallons] of water a day in summer," Walter said. "But if their root balls stay submerged, they die. The ones we planted here were failing because of high groundwater levels, so we've replaced them with water-tolerant rosewood, Dalbergia sissoo." The wadi's winter floods, during which Riyadh receives all of its average annual 100 millimeters (4") of rainfall, have spurred other engineering innovations in the valley's upper reaches. Walter pointed out the trapezoidal "dry weather flow channel" running down the center of the wadi bed, formed by melon-sized chunks of local limestone: Both the shape and the material minimize erosion damage. He explained that farm roads crossing the wadi have been lowered and the downstream side of each crossing packed with limestone rocks, gently sloped to dissipate the power of floodwater and minimize erosive subsurface eddies. In a few places where landowners had encroached on the wadi, the ada resorted to compulsory purchase to widen the flood channel in order to minimize the destructive power of water during flash floods. It's at al-Utaiqah, slightly further downstream, that the project's core idea, and its defining conceptual elegance, is revealed. 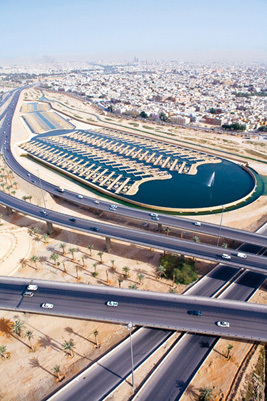 Overlooked by one of Riyadh's busiest highway interchanges, where King Fahd Road meets the Southern Ring Road, a new bioremediation facility takes the city's runoff and transforms it—naturally, with neither chemical nor mechanical intervention—into water clean enough for irrigation and recreation. Partially secluded, family-oriented picnic spaces line the bank of the wadi near the dam at al-Elb. None of these bioremediation techniques is new, but nowhere else have they been brought together on such a large scale—or at such low cost: Bioremediation requires roughly one-third the outlay that mechanical treatments do. It's a startling, disarmingly simple process to observe. Dirty water enters and clean water comes out, with good design the only human intervention. Chief beneficiaries are farms around the city, though plans are afoot to link a sustainable nursery to the irrigation system that will grow replacement plants and trees for the wadi. Fish caught in a 15 kilometer (9 mi) stretch downstream, to the point where effluent from the Manfuha plant enters, are safe to eat. Indeed, the restoration has spurred fishing as a leisure activity, particularly just south of the bioremediation facility at Stone Dam Park, where clean water passes over weirs and through rock channels into a broad, scenic artificial lake. "Before, I was afraid to come here with my family," he told me. "It was oppressive, too overgrown. Now," and he gave a little chuckle, "I feel like I'm by the Nile. If I get a break, I bring my kids down here to fish." Untreated run-off water enters the bioremediation facility by passing over a small dam called a weir. Falling over the dam, the water takes on oxygen, killing coliform bacteria. It flows into a main "head pool," and there, suspended solids begin to settle. An aeration system (the only mechanical element of the process) adds more oxygen. Then water passes over more weirs to enter the biocells, each two meters (6 1/2') deep. There, micro-organisms flourish on specially designed submerged structures, termed Artificial Periphyton Benthic Substrates. They feed on organic matter in the water, and they are themselves consumed by tilapia fish. Within each cell, the water passes over a low weir into a wetland zone, about 50 centimeters (20") deep, enclosing three small islands planted with trees and grasses that provide a riparian habitat alongside the aquatic one. Contaminants in the water continue to be assimilated by micro-organisms and tilapia, with dragonflies and other insects, frogs, snails, aquatic mollusks such as clams, and birds also entering the food web. Within each cell, the water flows out through a narrow "riffle zone." which is lined with limestone baffles to aid oxygenation, before crossing another weir into an outlet channel serving the next head pool, for more aeration. Organic sediment decomposes (helped by more tilapia), and inorganic sediment settles, for flushing and dredging. The entire 900 meters (half a mile) of bioremediation functions with a precisely engineered gradient of just 30 centimeters (12"), and yet every day it treats 600,000 cubic metres (21 million cubic feet) of urban wastewater. Aquaculturist Eric Morales, who monitors 22 criteria of water quality daily, is seeing the bioremediation facility becoming its own urban wildlife sanctuary. Recorded bird species include eagles, egrets, herons, and even seagulls, and Morales reports spotting catfish and turtles in the head pools. The Saudi Wildlife Commission is launching a program to study the new habitat. "There was something on tv," they said. "Then we noticed these signs." They gestured to the green-and-gold acacia logo on a location marker nearby. "The first time we came, we thought it would be desert, but this is landscaped. It's really different." In awarding the restoration project an Aga Khan Award for Architecture, the 2010 jury stated, "The Wadi Hanifah project eloquently demonstrates an ecological way of urban development." Leisure and tourism are obvious winners from the restoration, but as project director Al-Fayzi told me, real-estate prices have risen as individuals and developers seek opportunities in previously shunned neighborhoods. Restoring the natural balance has stimulated gentrification, and bankside landowners are upgrading their perimeter landscaping. More powerfully still, in a region where showy megaprojects often display disdain for the context they are set in, it seems that this most ambitious of engineering schemes— Saudi authorities have invested around $1 billion—has reconnected the city with a key aspect of its identity. 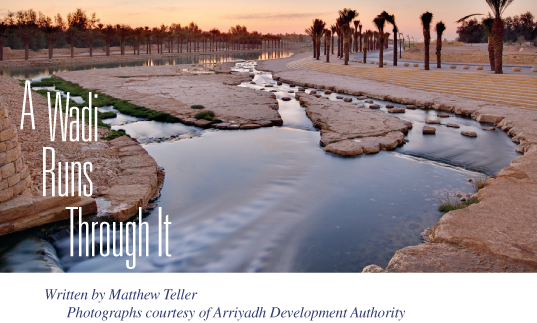 Wadi Hanifah is where Riyadh was born, yet for years, in Al-Fayzi's words, "nobody liked it." As it has transformed the water, the restoration has transformed the wadi itself from a source of embarrassment to one of pride. This puts Riyadh in global company: When London saw salmon returning to the cleaned-up River Thames in the 1980's, it was as if an old wrong had been righted. When a 2010 study announced that Washington, D.C.'s Potomac River had regained its beds of river grass, it was a step on the way to expunging the shame of President Johnson's 1965 declaration that Washington's polluted waterway was "a national disgrace." "We are just starting to bring in high-school and university students, so we can establish a knowledge base in environmental education," he said. "Water has completely changed this landscape. This is the first generation to deal with the wadi in its restored state. The story is not over yet." Matthew Teller is a freelance journalist and travel writer based in the uk. He broadcasts for bbc radio and writes widely on the Middle East for magazines and newspapers around the world. His blog is www.QuiteAlone.com. This article appeared on pages 10-15 of the January/February 2012 print edition of Saudi Aramco World. Check the Public Affairs Digital Image Archive for January/February 2012 images.